Atlantic Avenue and the Yards controversy. Atlantic Avenue has been called the Champs-Élysées of Brooklyn, an analogy that does neither thoroughfare any good. Atlantic is a broad boulevard that traverses the width of the Borough, from west to east. It begins amid piers facing the Buttermilk Channel, the strait separating Brooklyn from Governor's Island, and extends eastward into Jamaica, Queens, not far from Kennedy Airport. It does not include any vista of Brooklyn's triumphal arch, instead passing some ways to the south of it. While portions of it, as you will see below, have become chic, most of it is still characteristic of what the name "Brooklyn" evokes in many minds: ethnically diverse and gritty. My first view of Atlantic Avenue (a fairly comprehensive one, beginning not at the waterfront but at Boerum Place, a few blocks inland, and extending to its eastern teminus in Queens) was in the 1970s, when I was still living in Manhattan, and took a taxi to catch a flight at Kennedy. The driver knew that the quickest route from lower Manhattan to JFK at the afternoon rush was not the expressway, but straight-as-an-arrow Atlantic, which, despite the inconvenience of traffic lights, was not so heavily used. What I saw as we headed eastward was an amazing unfolding of the polyglot patchwork of Brooklyn: first Arabic, then African-Carribean, then Hispanic-Carribean, then a complex melange (on one block, I saw a social club for Cape Verde Islanders), then many blocks of grim industrial buildings with the now-elevated subway clattering overhead, followed by a semi-suburban stretch in which the names on commercial establishments were mostly Italian or Irish (Italy and Ireland are two of the "three Is" of traditional ethnic Brooklyn; the other is Israel). Since then, Atlantic has steadily been gentrified along its western stretch, from its origin at the waterfront to Fourth Avenue, coinciding with the same trend in the adjoining neighborhoods of Boerum Hill (which you can read about in its pre-yuppified state in Jonathan Lethem's The Fortress of Solitude) and Fort Greene. Fortunately, amid the proliferation of antique shops (like that shown at right) and clothing boutiques, some of the older establisments have survived. 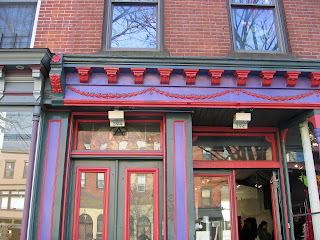 Some of these, like Sahadi's food market and the Damascus Bakery between Clinton and Court Streets, and the Brawta Carribean Cafe at the corner of Hoyt Street, have developed a yuppie following while keeping clientele from their respective ethnic communities. There has also been (as is common throughout the more desirable parts of the City in recent years) some conversion of formerly commercial buildings to residential use. 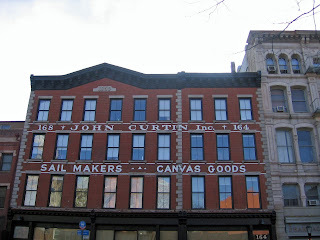 The building shown above is an example of this, but its owners have decided to highlight its original commercial use by repainting the faded sign that has adorned its facade for many years following the departure of Mr. Curtin's firm. 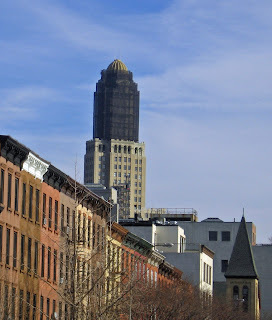 The dominant landmark over the western part of Atlantic Avenue is the Williamsburgh Savings Bank Building, for many years Brooklyn's lone skyscraper, and described in Slate by writer Jonathan Ames as "the most obviously phallic building I've ever seen." Check these views from Bridge and Tunnel Club, and see if you agree. I took the photo at left last Sunday, looking east from the corner of Atlantic and Hoyt. The uppermost part of the tower, including the clock face, is shrouded in scaffolding and black netting, because the Building, like so many older office buildings in New York City, is being converted to residential use. Apartments on the higher floors will afford some spectacular views. The steeple at the lower right corner of the picture belongs to a Belorussian Autocephalous Orthodox church. Just to the right of the Williamsburgh Savings Bank Building, where Atlantic, Flatbush and Fourth Avenues intersect, is Brooklyn's most contested site. A branch of the Long Island Rail Road terminates here, at the underground Atlantic Terminal, where several MTA subway lines also converge and thousands of commuters change trains. To the east of the Terminal are the tracks making up the LIRR's Vanderbilt Yard, which for some distance are below ground level but uncovered. Bruce Ratner, a real estate developer who has been very active in Brooklyn, plans to use the space above the rail yard, and some neighboring space, which will necessitate the demolition of some buildings, including some former warehouses that have been converted to loft apartments, to create an enormous mixed-use complex known as Atlantic Yards. The focal point of this development, occupying the apex of the wedge formed by the intersection of Atlantic and Flatbush Avenues, would be an arena for the Nets, the NBA team now playing in New Jersey, but which Ratner has bought and has said he intends to bring to Brooklyn. Coincidentally, this is the same site on which, in the early 1950s, Walter O'Malley wanted to build a new park for the Dodgers to replace Ebbets Field, a plan that was vetoed by Robert Moses, who wanted to relocate the Dodgers to Flushing Meadows, Queens, which is where Shea Stadium was eventually built for the Mets. O'Malley wouldn't take his team east to Queens, and instead took it west to Los Angeles. The proposed Nets arena alone would be sufficient to raise controversy because of the additional traffic it will generate, although it is located on one of the best sites in the City for mass transit accessibility. It is what else Ratner proposes for the entire 22 acre site, though, that has elevated the animosity between those supporting and those opposing the project to a level that the Village Voice has characterized as a second "Battle of Brooklyn" (for details about the first one, see here). Looming above the Nets arena would be a huge office building, designed (as will be the arena and the rest of the buildings on the site) by Frank Gehry, and dubbed "Miss Brooklyn". This building would be considerably taller (though plans have recently been downsized) than the nearby Williamsburgh Savings Bank Building, thereby violating what some project opponents claim is a taboo, rather like the Philadelphia version involving Billy Penn's hat (see here), which was broken in 1984. If Miss Brooklyn is built, perhaps Priapus will put a curse on the Nets (and maybe my beloved Cyclones as well) just as Billy Penn is said by some to have done to the Eagles, Flyers, Phillies and Sixers. Below is a view, prepared by Gehry's firm and taken from the image gallery on Ratner's official Atlantic Yards website, of the arena and Miss Brooklyn, seen from the south at night. Note the Williamsburgh Savings Bank Building at the far left of this view. Note also in the view above the buildings extending beyond the arena/Miss Brooklyn complex, as well as the one to the left, west of Flatbush. In addition to office buildings and a hotel, the site is planned to include thousands of apartments, including both market rate and "affordable" units. Opponents of Atlantic Yards have mostly united under the slogan "Develop Don't Destroy Brooklyn" (see website here). They have objected to the project because of the already-mentioned traffic issue, as well as the effect the scale of the development will have on surrounding, largely low-rise residential neighborhoods. In addition, they point to the possible use of eminent domain to clear portions of the site, which would constitute a taking of private property by government to further a private development, on the theory that the development serves a public purpose. Such a taking of property was recently upheld by the U.S. Supreme Court in its controversial 5-4 decision in Kelo v. City of New London (see here). Those supporting the project include people who think they may benefit from the jobs it will create, sports fans excited about bringing a big league team to Brooklyn, and those who simply believe that likely benefits of the proposed development outweigh its costs. Among these last are Mayor Bloomberg, Brooklyn Borough President Markowitz and, apparently, Governor-elect Spitzer. Both sides have employed visual propaganda to bolster their arguments. The Gehry firm has produced depictions of the public spaces within the Atlantic yards development (see example at right), which project an Edenic image of urban oases, an image made explicit by a quotation on the official website from Herbert Muschamp, architecture critic for the New York Times. An opponent of the project has done a Google Earth rendering of the proposed buildings (see below; image by John Keegan from Invisibleman; this image is licensed under Creative Commons) which produces monolithic representations lacking in architectural detail. Note also that the proposed buildings are colored an angry red, not a soothing blue or cheerful green (in the Gehry depiction above, they are a mixture of angelic white and lustrous gold). Some of the most insightful commentary on the Atlantic Yards brouhaha, in my estimation, comes from a writer and blogger named Steven Berlin Johnson, who lives in Park Slope, and is therefore in a position to be affected by the project. In this post, he links to John Keegan's Google Earth model, shown above, but Johnson notes that he, like me, is a qualified supporter of the project. (If you scroll down into the comments, you'll find a thoughtful rejoinder from Keegan.) And here he links to an article on contemporary misunderstandings of the urbanist philosophy of Jane Jacobs, written by the unrelated Karrie Jacobs and published in Metropolis Magazine, that refers to the Atlantic Yards controversy. Johnson's commentary, as well as that in the comments following the post, is also well worth reading. 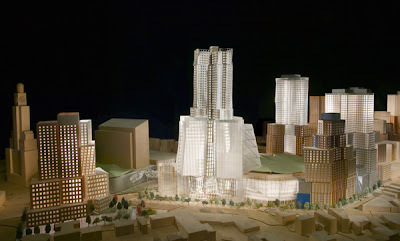 12.12.06 Update: James Gardner, in today's New York Sun, pans Gehry's first major New York City commission to be completed, the IAC Building at 11th Avenue and 18th Street, in Manhattan. 12.19.06 Update: Yesterday's Sun editorialized against approval of Atlantic Yards by the Public Authorities Control Board, cheering for Assembly Speaker Sheldon Silver to do an encore of the "Dr. No" role he played regarding the West Side Stadium. The Sun editorialist doesn't object to the project per se, just to the use of eminent domain to condemn private property in order to build it. But, in today's Sun, columnist Nicole Gelinas attacks the Atlantic Yards proposal root and branch, on "free market" grounds, calling it "A Bit of Everything [that's] Wrong" with New York City. 12.21.06 Update: Contrary to previous reports that a vote would be delayed until January, the Public Authorities Control Board yesterday approved Atlantic Yards. This closes the regualtory process, meaning the only remaining obstacles to the project are several citizen group lawsuits. The Times article is here, but you need to register (which you can do for free) to see it; the Sun's piece is here. According to the Times story, one of the compromises made to secure approval was a reduction in the height of "Miss Brooklyn" to less than that of the Williamsburgh Savings Bank Building, so Priapus can relax.